When I was in college in Oklahoma, I really missed eating my mother’s moose meat soup. When my cousin, Doreen, came to visit me from Kansas, I told her so. She said, “You can make soup with beef stew too.” It made me realize that I can cook soup even though I was far away from home. 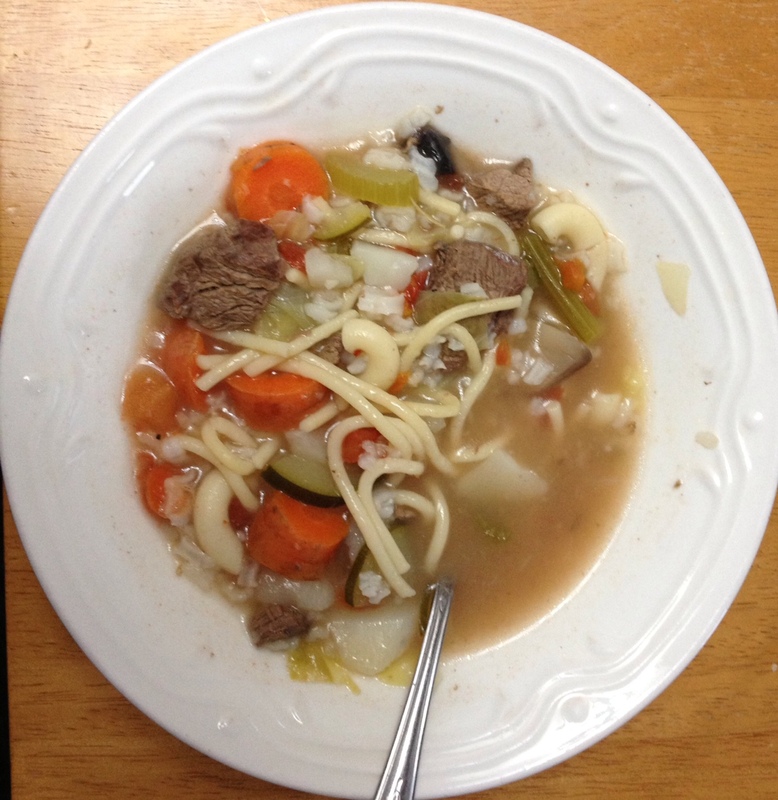 Cooking soup with beef stew meat is not the same, but eating it made me feel closer to home. Defrost meat. Put meat in large pot and fill water to about 3/4 from the top. Bring meat to boil on high, then turn to medium and cover. Add seasoning, salt and onions at the beginning. Boil for about 90 minutes and stir occasionally. Chop and prepare vegetables into bite-sized pieces. Add vegetables, noodles, spaghetti and rice. Add water if necessary. If you like a thicker soup, do not add as much water. Cook for an additional 25-35 minutes. Add can of stewed tomatoes, season to taste and enjoy. You can substitute other meats (deer, caribou, reindeer, buffalo, beef stew) for moose meat. The other meats won’t need to boil as long as moose meat. You can also use ground moose meat, and it can be boiled for about 45 minutes before adding other ingredients. If you are making bone soup, you can boil the meat up to 3 hours before adding vegetables and pastas. 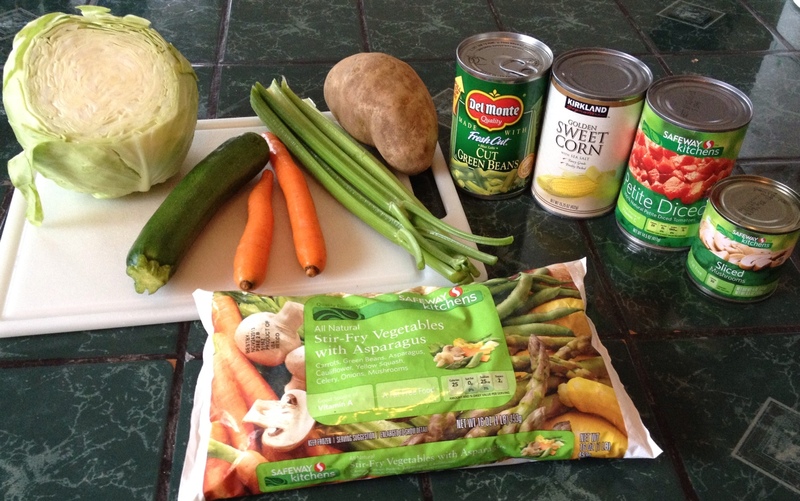 You can substitute fresh vegetables with frozen or canned vegetables. You do not have to use all of the ingredients. You can improvise and use other ingredients that you like. About 5-6 ingredients is sufficient. You can also cook these in a slow cooker. I learned how took cook soup by experimenting and improvising. My daughters and I made an instructional video to assist you as you make your own soup. My goal when presenting to the students was to share this lesson with them. They can make their traditional foods while they are far away from home. College was a very challenging time of my life, being far away from home and out of my element. I graduated from high school in a town that had 50-100 people, and attended a college with about 4,000 students. Culture shock! Keeping ties with my traditions kept me grounded and strong. Sailor Boy Pilot Bread as Pop Art? 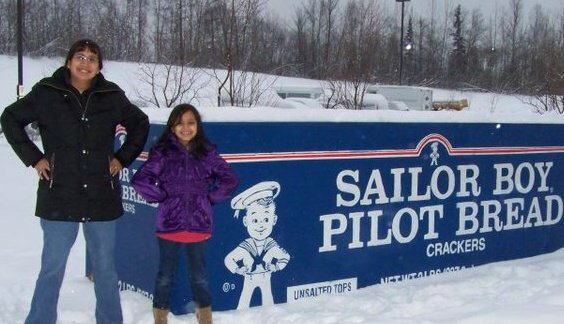 There is a Sailor Boy Pilot Bread Cracker box being displayed at the Nat’uh Non-Profit Service Center in Anchorage, Alaska. You might be wondering what it is and what the significance of it for Alaska Natives. It is a large cracker that can be eaten with just about anything and is a staple food in Alaska. I heard that Alaska is the largest consumer of the Pilot Bread crackers. I love eating Pilot Bread crackers topped with butter, cheese or peanut butter and with a cup of tea. Karen Larson created the Sailor Boy Pilot Bread project in conjunction with the Warhol Exhibit by the Anchorage Museum and a subsidiary local art project called Pop 11. The Box was originally displayed at Westchester Lagoon, and is currently on loan to the Nat’uh Non-Profit Service Center for a couple more weeks. That was in the early 1900’s. Here we are in the 2000’s and still enjoying Pilot Bread crackers! There is an Alaska Native band called, Pilot Bread Band. There is a Facebook group page called, Pilot Bread: Sailor Boy Fans Unite! 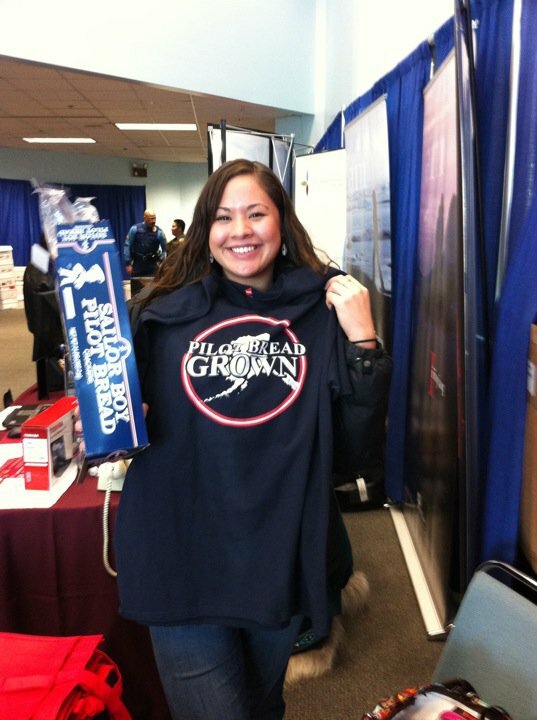 Nomadic Stars sells “Pilot Bread Grown” t-shirts and hoodies. In 2010, Cathy Jones wrote about 13 Ways to Eat Sailor Boy Pilot Bread. It truly is pop art in Alaska!